The American people would have been well-served if John McCain had been defeated by Dr. Kelli Ward, an actual patriot who puts the interests of the American people and our nation ahead of those of the globalist cartel. There is no more stinging reminder of the sellout trash that is Senator John McCain than this public denouncement of five Congressmen on the Senate floor in 2012, a desperate act to protect the placement of a Muslim Brotherhood operative at Hillary Clinton’s right hand. It’s impossible to say how much damage Senator McCain inflicted upon this nation by stifling an investigation into Huma Abedin while she was at the Department of State, engaging in the illegal and traitorous movement of government documents into a location from which they could easily be lifted by those desirous of our state secrets. There is also no way to know how much damage we sustained from her supplying information directly to the Muslim Brotherhood and other terrorist groups through her extensive connections. It was an urgent plea to have those connections investigated by Michele Bachmann, Louie Gohmert and three Congressmen that prompted the emergency response by McCain. 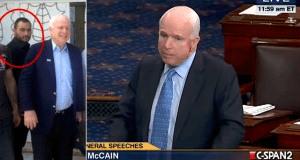 McCain invoked accusations and statements that are remarkably similar to those of Hussein Obama. He prejudged what was little more than a request for an investigation as an unfounded witch hunt, akin to claiming that they acted stupidly or that there was not a smidgeon of truth to what were not even allegations but questions raised out of a patriotic concern, having no basis for making such a conclusion. He says Huma Abedin represents what is best about America, the daughter of immigrants. McCain doesn’t mention that those immigrants left this country when she was two years old to help form and work in the family business, the Muslim Brotherhood. McCain for some reason didn’t want an investigation to take place and was motivated to attack the source of the report and everyone associated with the request. Senator McCain has long had relations with unsavory types in the Middle East in which he pushed for their armament and for creating situations of conflict and aggressive American intervention. He’s even been photographed meeting with the leader of ISIS and other terrorists. McCain exhibits another of his many characteristics that he shares with Hussein Obama, attacking the credibility of the producer of the document which was the source of concern with accusations that are nothing short of the same type of false character assassination that he opened his remarks claiming to be motivated to prevent. He describes the report as scurrilous and the questions about Abedin as “nothing less than an unwarranted and unfounded attack on an honorable citizen, a dedicated American and loyal public servant, all three concepts McCain is woefully unfamiliar with. McCain deliberately attempts to create the impression that Abedin has no connection to the Muslim Brotherhood or Islamic terrorism, statements he either knew were false at the time or didn’t care enough to investigate. The information that is coming out regarding the shenanigans that were standard operating procedure at the State Department as well as the mother of Huma Abedin, her deceased father, her siblings and herself in support of fundamental Islamic extremism are exposing McCain as a possible fool but a more probable tool, an operative whose loyalty also is deserving of scrutiny. 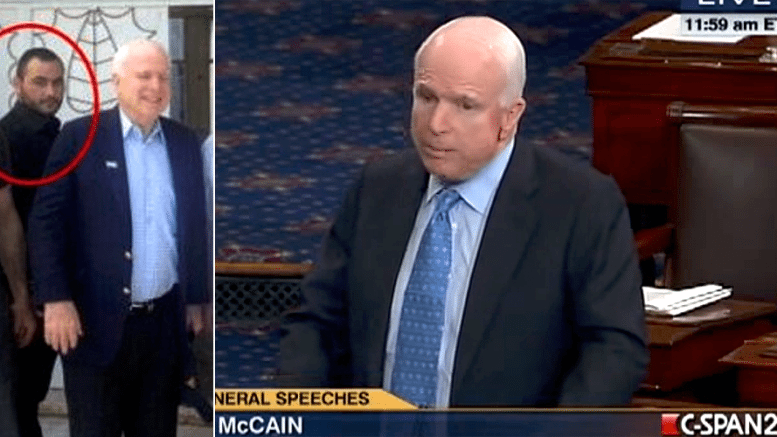 Who is Senator McCain representing? It’s not the people of Arizona nor is it the American people. It’s the special anti-American interests that keep him, Hillary Clinton and Huma Abedin in power. They’re the same ones that just saved his bacon in the Arizona primary, who weren’t prepared to lose the services of their valuable puppet just yet. Bill Clinton Schools Obama, Tomi Lahren Schools Them Both!